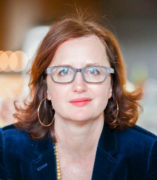 Robin Reames (PhD Carnegie Mellon University 2009) works in the history of ideas, particularly the ideas that compose the field of rhetorical theory. Her research is guided by an interest in the visceral and primordial power of human speech, for which ancient rhetoric serves as a first theory. Her book, Seeming and Being in Plato’s Rhetorical Theory (University of Chicago Press, 2018) examines how Plato used rhetorical theory (the theories of mimêsis, onoma, rhêma, and logos) to forge the primordial distinction between seeming and being—the foundational fissure from which Western metaphysics emerged, and the very grounds of the opposition between true and false. Her edited volume Logos without Rhetoric: The Arts of Language before Plato (University of South Carolina Press, 2017) gathers works by the some of the most prominent scholars of Ancient Greek rhetoric to examine the status of rhetorical arts in texts that pre-date Plato’s coining of the term “rhetoric.” She is currently editing, with Patricia Bizzell and Bruce Herzberg, the 3rd edition of The Rhetorical Tradition: Readings from Classical Times to the Present (Bedford St. Martins, forthcoming in 2019). Other published work has appeared in Rhetorica, Philosophy and Rhetoric, and The Journal of Communication in Religion. Reames teaches graduate and undergraduate courses in contemporary and ancient rhetorical theory, language theory, rhetorical criticism, political rhetoric, writing, as well as courses in literature and literary theory.